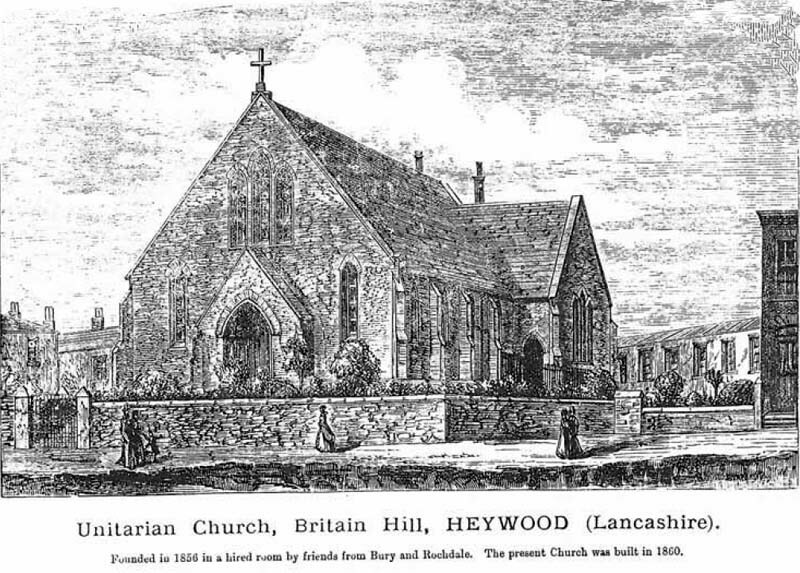 Unitarianism first started in Heywood in the year 1856. There was probably only one family of Unitarians resident in the town, that being the Nuttall family of Broadfield Farm. They had a fairly large family and used to go regularly to the Unitarian Church at Bury, taking their meals with them. The Nuttalls were instrumental in bringing missionaries into the town. The late William Wild was interested and used to travel to Bury to attend the Unitarian Church. A small room in Oak Street, on the old market ground, now the Memorial Gardens, was rented at Is. 6d. a night. The first service was in June, 1856. The preacher was the Rev. John Wright, B.A., who had a congregation of eight persons, and some of these had grave doubts whether they were doing right in being there. On the second Sunday Mr. Benjamin Glover, a lay preacher residing in Bury, preached. He was so enamored of the work that he acted as honorary pastor of the new congregation. After twelve months it was felt that a larger room was necessary and a more suitable one was obtained at Mossfield. Here the pioneers remained for three years. The first services held at Mossfield, in September, 1857, were conducted by the Rev. William Gaskell, husband of Mrs. Gaskell, the author of Cranford. A Sunday school was started, and over fifty scholars were entered on the books on the opening day. The first person to put in an appearance was James Partington, a young man who, on hearing that the Unitarians were about to open a Sunday school, resolved to join at once and, in order that he might not be late, got there so early that he had to stand for a considerable time before the door was opened. The connection which James Partington formed on that day continued; he was to serve both school and church in many offices. Mr. Robert was appointed superintendent of the school and Mr. William Healey, Sen., secretary. The school and church at Mossfield fast outgrew the accommodation and it was felt that something must be done; so a movement was started to build a church. Mr. Thomas Wrigley of Bury offered £100 towards a building fund. After Hind Hill had been refused to a Unitarian body, Britain Hill was chosen as a suitable site. It contained 7,589 square yards and was leased at three farthings a yard on a yearly rent of £23 lls. 4d. At that time there were few houses in the neighbourhood and the question arose in the minds of some why so much ground should be wanted. But subsequent events have shown the wisdom of the undertaking. Most of the surplus land was very quickly let for building plots at double the rent at which the Trustees had leased it, so the Chapel soon became almost free from ground rent. Britain Hill was a rough piece of land, and much hard work had to be done before it was fit to build upon. This work was undertaken by members of the church. Among the old pioneers were such men as Messrs.
Chadwick, Firth, Healey, Jerrard, Nuttall, Rhodes, Whitworth, Wild and others. The descendants of many of the pioneers are still with us, but we have room for more.Thomas Wrigley, Esq., added another £50 to the £100 he had promised. John Grundy, Esq., of Summerseat gave £100. It was thought that £1,000 would be required for the building, but owing to the failure of the builder and other causes it cost an additional £700. The congregation raised about £90; £384 was received from Bury; £211 from Manchester; £52 from Rochdale; £67 from Liverpool; £20 from Pilsworth and £14 from Bolton. Also £104 was given in the opening collection. Mr. Thomas Wrigley laid the foundation stone on Saturday, August 29th, 1859, and received a silver trowel from Mr. Ivie Mackie, Mayor of Manchester. The opening service took place on Wednesday, November 14th, 1860, the preacher being the Rev. W. H. Channing, nephew of Dr. Charming. The first minister was the Rev. John Fox, who commenced his duties on the first Sunday in Mar, 1864, the services in the meantime having been taken by such worthy men as Benjamin Glover and others. The first marriage to be solemnised was on December 27th, 1866, between Joshua Dawson and Alice Chadwick. In the early days the congregation was not wealthy enough to procure a harmonium or a player. Eventually William Gerrard paid for his little girl, Mary, to be taught to play, and she rendered yeoman service on the harmonium up to her marriage, when she became Mrs. Walter Edwin Schofield. Her family was prominent workers for both school and chapel, and her descendents are still connected with Britain Hill. During the Rev. John Fox's ministry the church became financially independent of the North and East Lancashire Mission. A new activity began when the youths of the school formed themselves into a Drum and Fife Band. This, when the youths had become young men, was changed into a Reed Band and continued for 50 years. A report of an award in the Heywood Advertiser, August 30th 1978, declared "I was very glad to hear that the Unitarian Band had got a prize, which I believe is the first prize that was ever brought to Heywood by any band!" Mr. Fox terminated a successful ministry in 1878. His closing words were: " And now I have done. I have dreaded to see this day more than I can tell. My ministry here has reached its close, and ere long it will be only a memory. To some of you at least it will be pleasant to reflect upon; and if any good influences arise there from, to comfort your hearts, to direct your lives, to give you higher and worthier aims in life, I shall not have lived and laboured in vain. Wherever my lot may be cast in the future, I shall always feel a deep interest in this church and shall always be glad to hear of its welfare." The Rev. William Bennett commenced his ministry in November, 1879, but was taken away by death in January, 1882. His remains were interred at Dumbarton, Councillor S. Firth and Mr. Josiah Ridings representing the church at the interment. A liberal grant was made to the widow and a day school was started with Mrs. Bennett as the schoolmistress. Some who are now leading members of the congregation were among her pupils. The Rev. J. E. Stead commenced his ministry in 1883 and continued successfully until 1891. He was a leading light in the anti-vaccination movement, and had part of his furniture sold to meet a fine imposed upon him for refusing to have his child vaccinated. He was also interested in natural history and was often called upon to lecture on the subject. In 1885 one of the first football teams in the district was connected with the school. Going through the names of the players gives this result: Each had been or was connected with the Band; two became choir master; one, leader in the dramas; another, bandmaster; three became Mayor of the borough; one, Mayor of Oldham; at least three became President of the Church. The Rev. T. B. Evans took over in 1892 and continued until 1913. In addition to serving the congregation from the pulpit he was ever ready to advise parents on the education of their children. He also played a great part in the education movement of the town. The Sunday school was in a flourishing condition. The superintendents were Mr. William Healey and Mr. David Healey. They had followed such men as Messrs. Robert Nuttall, George Lee, Thomas Rhodes, Sutcliffe Firth, Edward Collinson, John Dewhurst, Samuel Kay and William Chadwick. In 1898 the meeting of the Provincial Assembly of Lancashire and Cheshire was held at Heywood, the preacher being the Rev. L. de Beaumont Klein, D.Sc., F.L.S., of Renshaw Street (now Ullet Road), Liverpool. The new school was opened on March 27th, 1897, and, after extensive alterations and additions, the chapel was reopened on February 24th, 1898. 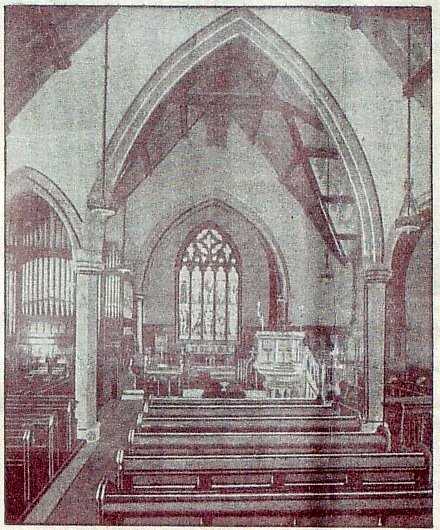 The unveiling and presentation of the chancel window took place on Saturday, September 24th, 1898-unveiled by Mrs. David Healey, presented by Mr. David Healey. The sermon was preached by the Rev. H, E. Dowson, B.A. The figures in the window tell their own tale. 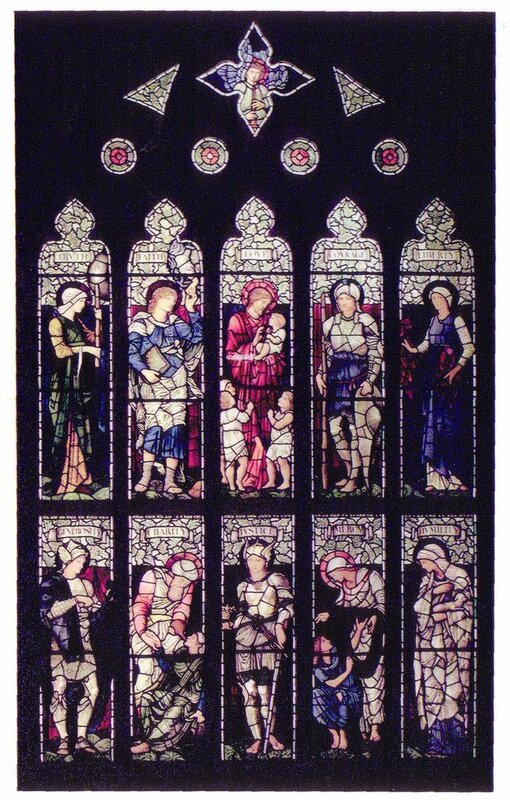 The ten figures depicting the various virtues were designed by the late Sir Edward Burne-Jones and executed by the firm of Messrs. Morris and Company. The background consists of curtains behind the figures. The groundwork of the window is a specially designed foliated ornament with a scroll above each figure, upon which is written the name of the virtue represented, while the tracery spaces are filled with Seraphs and Gresaille ornament. The upper set of figures represents Truth at one extremity, Liberty at the other, and, between them, three aspects of religion-Faith, Love and Generosity. The lower figures in the five lights illustrate the theme, "Do justly, love mercy, and walk humbly with thy God." Accordingly we have at one extremity Humility; in the centre, Justice; and on one side of it the figure of Mercy. On the other side is Charity, represented by Dorcas-a tribute to the memory of good women who have been and are working in our midst. The remaining figure, amour clad, is Fortitude, the pioneer, and is a memorial to those who fought the good fight and founded the church. The Jubilee Celebrations and Reunion of Past and Present Worshippers took place on June 23rd and 24th, 1906. On the 23rd there was a tea, then a public meeting in the chapel, under the chairmanship of Alderman Sutcliffe Firth, J.P. On the Sunday the Rev. Douglas Walmsley preached morning and evening. In the afternoon the Band gave a Musical Service; the chairman was Mr. S. A. Rhodes. On Saturday, November 19th, 1910, a reunion and soiree was held, being 50 years since the present chapel was opened. Alderman William Healey, J.P., C.C., was chairman. Addresses were given by the Rev, John Fox, Mr. T. Harwood, J.P., Mr. David Healey, J.P., Mr. William Wild, J.P., and the Rev. T. B. Evans, M.A. The Sunday services were conducted by the Rev. T. B. Evans (morning) and the Rev. J. C. Odgers, B.A. (evening). Weber's Jubilee Cantata was given by the choir and scholars in the afternoon. The school extension was opened on February 28th, 1925, by Alderman David Healey, J.P.; Councillor Walter Duckworth was chairman. The Provincial Assembly again visited Britain Hill on June 23rd, 1926. One June 20th and 21st, 1931, the Seventy-Fifth Celebrations were held. The Rev. T. B. Evans, M.A., preached morning and evening. The afternoon preacher was the Rev. F. Munford, B.A., who will, we hope, also take part in the forthcoming Centenary Celebrations. Many members of the church have taken their part in local government affairs. Eight members who have been President of the Church have also been Mayor of the Borough, three of whom, Alderman W. D. Healey, J .P., Mr. James Hunt and Mr. Herbert Holt, are regular members of the present congregation. Fifteen Mayoral Sundays have been held in the church. Several other members have served on the local Council and the Board of Guardians. The church has been served by several ministers since 1913; viz. : the Revs. Joseph Worthington (1914-16), F. Munford, B.A. (1917-1927), J. W. Lee (1928-1933), G. S. Whitby, M.A., B.D. (1934-1938), F. Sokell (1939­1945), W. H. Payne (1946-1951) and F. J. Hamblin (1951-). The limited space prevents us giving details of the activities of all the ministers who have had charge of Britain Hill, or of superintendents and others who have taken up work in both church and Sunday school, or of those helped sustain such good causes outside our walls as the Inskip League of Friendship and the Blind Society, besides other charitable, cultural and sporting activities. We are not in the happy position, as regards numbers and finance, that we have been in the past; but we do: hope that our people will realise what efforts and hardships had to be overcome before we were enabled to worship in our own way, and show that our forefathers laboured not in vain.